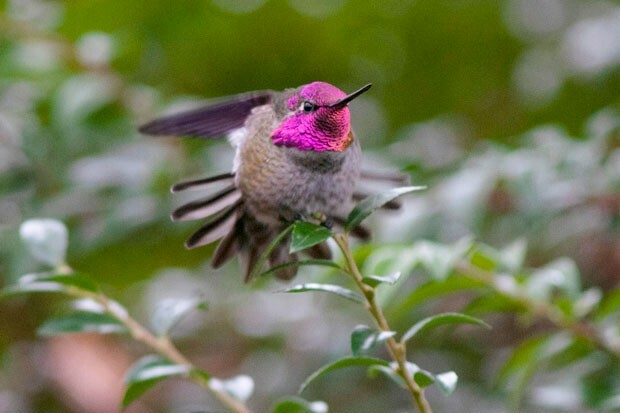 Reports from all over the Willamette Valley, aka The Swamp, are coming in on Oregon Birders Online with the news of hummingbirds from the California border to the Columbia River. A male Anna's hummingbird, photographed while surviving a brutal winter storm. According to one account: "Our hummingbird feeders are exploding with hummingbirds right now. This is the most spring hummers we've had in a very long time. Rather entertaining. North of Bandon Coos City." I'd say it's time to put up your hummingbird feeder, as well. But please, good people, don't use the commercial formula with the red food coloring in it. That chemical junk does nothing good for wild birds — or for you and me! Just mix up a ratio of three-to-one water to white sugar (no other sugars or honey) and that will suffice. And remember, birds (and you and me) cannot get by on sugar water alone. For hummingbirds, it's just a shot in the arm, giving them the juice they need to keep up to speed and rebound from a cold night or a cloudy day. They MUST have arthropods in their gut to keep 'em goin', so put in a flower garden that will attract pollinators, producing plenty of insects to keep the hummers humming. Hummingbirds have a very tight association with spiders—eating them and their insect prey. In addition, the females use spider silk to construct their unique cotton-like nests, wrapping spider silk around the fluff from dandelion seed parachutes and tying it to a limb. But sometimes, the shoe is on the other foot. One afternoon at the Oregon Museum of Science and Industry's Camp Hancock, I happened to be at the "right place at the right time." As I was approaching the camp's motor vehicle fuel storage tank, I heard young voices shouting, "Boooooooo!" I came upon a group of students intently looking at something under the tank. One of the young men exclaimed, "Look at that Mr. Anderson," pointing to the rounded bottom of the tank. It turned out be a female rufous hummer caught up in spider silk. "Yeah," the young man agreed and then exclaimed, "But look there!" pointing to another spot close by. 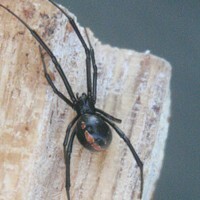 There was a robust female black widow. "Here she comes," he added as the spider started down her line toward the hummer. "Boooooo," the kids started moaning again as the widow advanced. The hummer went into a frenzy as the spider approached her, beating her wings like mad. The spider stopped, blipped her bottom on the tank to attach another line and again advanced on the hummer, who began beating her wings—but her feet were stuck fast to the silken line. After about a full minute of this standoff, the spider retreated, the hummer hung head down, exhausted. The kids all cheered, "Yaaaaaay!" 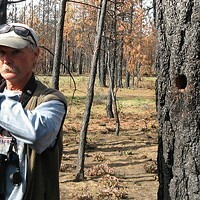 Then a discussion started about whether we should interfere. I voted no, and being the only adult present, I explained this wasn't anything we had to do with. The hummer was collecting spiderweb to build her nest and got a little more than she bargained for. The spider was only trying to ensure she had enough to eat, and that's the way it was. Just as I finished my take of the situation, the spider began to advance again, and the kids all went, "Boooooo!" This time, the hummer really poured on the coal and actually broke free of the silk (which I really didn't think she could do) and flew off to a resounding "Yaaaaaaaaayyyy!" 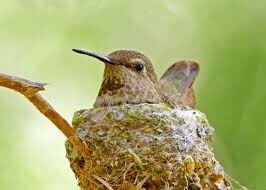 Another point about hummers and nesting: there is no such thing as a hummingbird "family." As far as I know, dad is only in the picture at the very beginning, to supply sperm to fertilize the eggs, leaving mom to build the nest, lay the eggs, hatch them and care of her young until they leave. Now, about our cold nights and your feeder. It's OK if hummers find it—that's why you put it up in the first place. If the night should go down to the teens, the hummer will find a sheltered spot and go into a torpor, that, if necessary, can last 36 hours with no harm to the bird. In closing, I'd like to share a story from Don Miller, an old pal from the OMSI days of the '60s. He's also the guy who took the photo in this story. "It seemed a good day to stay indoors with 50 mph wind gusts and the power out at 11 am. My small house sits amid the giants of the Pacific Northwest forests, the Douglas fir. A good day to stay inside. "My thoughts turned to the Anna's hummingbird. The only hummer to winter this far north, I had a male that came to my feeder every day. Would he make it this stormy winter day? 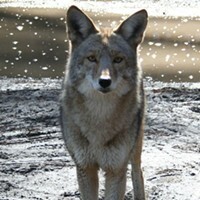 I kept a watchful eye, but not for long. Soon he appeared, amazingly little affected flitting through the waving shrubs then alighting on the feeder. He has a favorite perch on a huckleberry bush about 30 feet from the feeder which rustled with every wind gust. "Undeterred, he took to his perch, every once in a while giving a quick buzz of wings and tail for equilibrium when a gust struck. Feathers puffed for warmth, even on this gray day his throat and head flashed their iridescent color. Always bashful at the feeder, I never wanted to photograph him there, but with my 40-year-old tank of a telephoto lens maybe I could photograph him as he perched 30 feet away. He brought me humor though as I pulled out an 8-pound lens to photograph this bird, weighing less than a sheet of paper, not to be grounded by a winter storm!"